PVC Liners in their most common thicknesses of 20, 30, & 40 mil are highly flexible films. PVC can be an excellent choice for applications that require the containment of chemicals and waste. PVC can also be used for containing water and is often used for landfill liners and mining applications such as coal ash. PVC can be formulated with several different resistances including oil resistance and fish safe properties. It is highly impermeable and with its high malleability due to being such a flexible film, can conform very well to its surroundings. Although variations are being created today that allow pvc to withstand high u.v. exposure, most pvc liners only come with a warranty if they are buried or not used in an outside environment. PVC is one of the oldest and most trusted geomembranes on the market today. Due to its positive reputation, It is specified into many jobs for construction and government projects. Western Environmental Liner has many years’ experience with PVC liner manufacturing and can help you choose the correct thickness and type for your project. A few of the applications PVC are used in can be seen in the grid below. To learn more about pvc liner and other liner materials, contact Western Environmental Liner today. Long Term Pond Liners buried. Containment Liners if inside. Landfill liners . 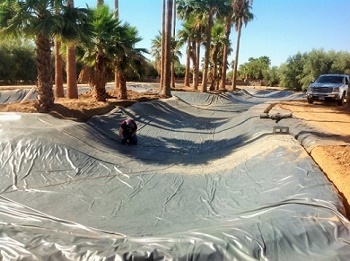 Retention Pond liners, Temporary oil containment. Buried Pond Liners such as recreational liners or Golf Course Pond Liners, Evaporation Ponds. Retention Ponds, Temporary oil containment.